I commented on another blog yesterday that taking photographs forced me to pay attention to places I visited. I still think that is its greatest single benefit, but taking your own pictures also gives you a real appreciation of great photographers because you realize what dedication and time it takes to get the kind of shots they get. Great photography requires being in the right spot at the right moment with the right equipment. Today many prosumers (yes, I’ll admit to being one of those) have top quality photographic equipment, equipment just as good as the top photographers have. It’s really being at the right spot at the right moment that is nearly impossible to match. Being friends with serious birders, I regularly visit top birding spots, and not just hot local birding spots. It’s relatively easy to find great shots to shoot, though it often requires more dedication, and time, than I have to actually get to them. The biggest difference between me and professional photographers is simply the amount of time spent getting shots. Here’s a shot that had a lot of potential that I took on an early December walk through Theler. After John reported sighting a Harlan Hawk, an uncommon variation of the Red-Tailed Hawk, I spent several trips trying to get shots of it. On my four visits I got several shots, but this was definitely the best pose I managed. If there had been more light, I could have used faster shutter speed and avoided the blur in the shot, not to mention getting better detail in the shadows. As it is, I’ll end up deleting the shot after posting it today. 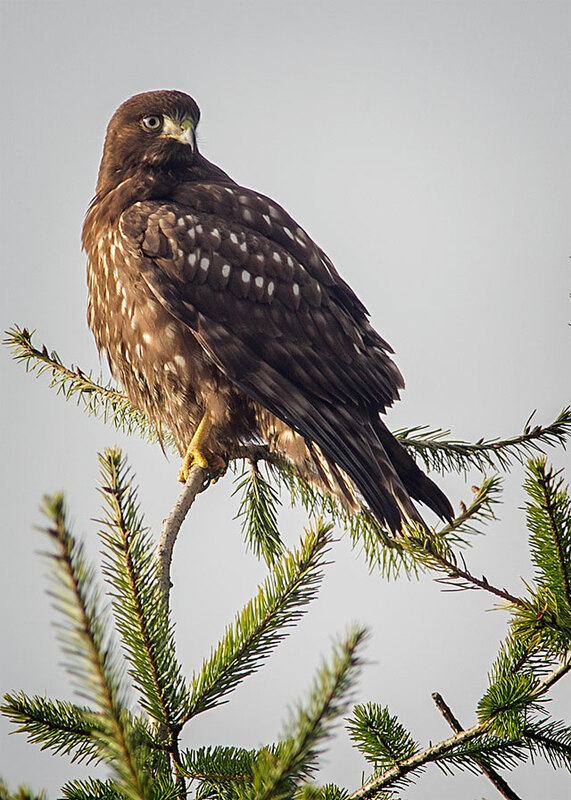 Two hours later there was better light, and I got this shot of the same hawk poised at the top of a pine tree. It was taken at a considerable distance and had to be cropped considerably, but the details are still much better than in the above shot. If the bird had been willing to do anything but sit there peering at me, I might have gotten a better shot, but after twenty minutes of watching it, it flew away across the field. I’m sure a professional would have sat down and waited an hour or two for it to return, but it was nearly 10:30, I hadn’t eaten yet that day, and there was a wonderful Chile Rellenos waiting for me at La Palapas in Port Orchard. are easily available on sunny days simply by visiting areas I enjoy walking. On the other hand, it takes more patience, and a certain amount of luck to get a picture like this one. 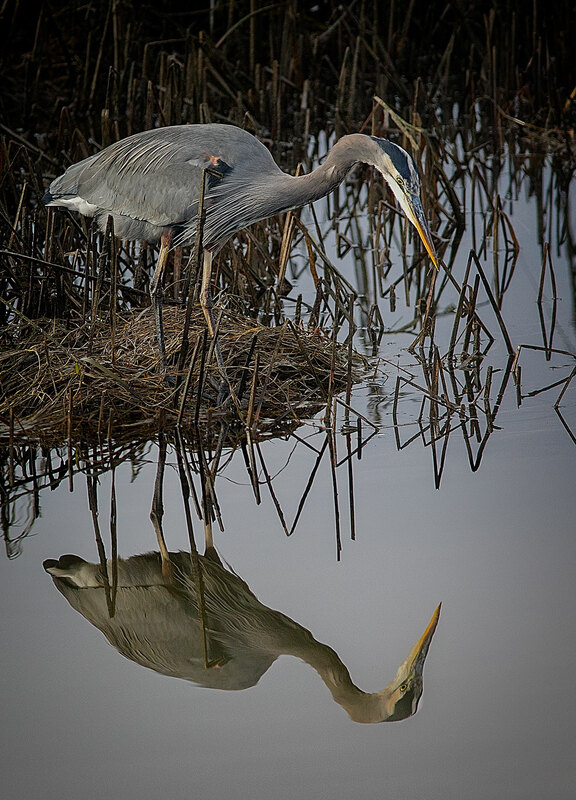 Of course, if I could convince the heron and the sun to stand still while I waited, I could always count on a shot like this if I simply waited long enough. 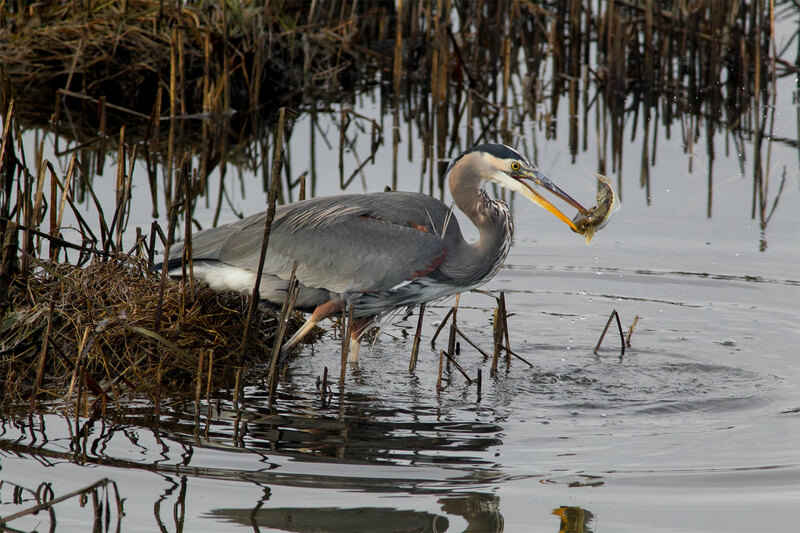 Herons need to eat so they stalk where they can find food. On this day, however, I couldn’t count on the sun not ducking behind a cloud at any time, and it’s nearly impossible to predict when a heron will fly off to a new fishing area. 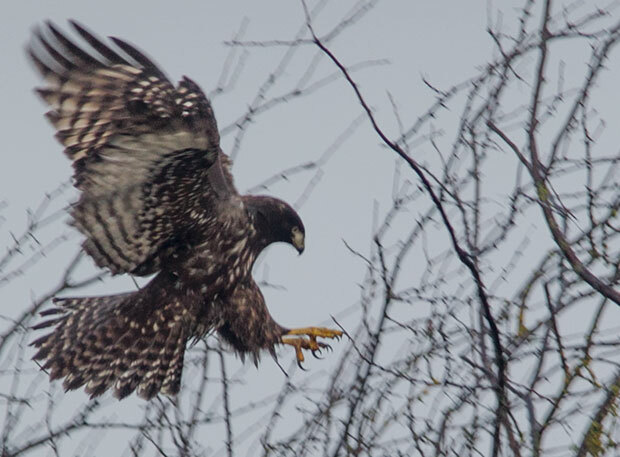 No, there’s a certain amount of luck involved in getting great bird shots, which is not to say that spending more time photographing birds won’t increase your “luck,” it will. I suppose I could resolve to take more “professional” photographs this year, but I’m more apt to resolve to spend more time meditating this year than I am to spend more time photographing. I don’t have the drive to become a professional photographer; I don’t have the drive to become much of anything, for that matter. I’m pretty content just being a “professional” retiree. Excellent photos. You really have this nailed. Great post, Loren! Right on point.